The electroencephalogram (EEG) is one of the most popular measures of human brain function and is currently the most clinically utilized. The EEG primarily reflects the synaptic activity of patches of neocortical pyramidal cells (at minimum probably around the order of 25 mm2–(Baillet, Mosher, & Leahy, 2001) and its most salient feature is intermittent oscillations at various frequencies (Fig. 1), which vary according to brain state (e.g., awake vs. slow wave sleep) and cortical area/scalp location. 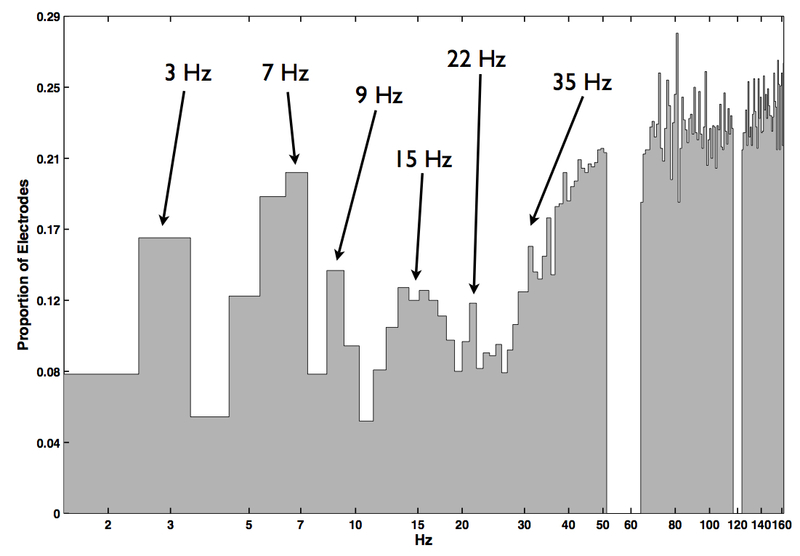 The most conventional frequency bands are: delta [1–4 Hz], theta [4– 8 Hz], alpha/mu [8–13 Hz], beta [13–30 Hz], gamma [30–80 Hz], and high gamma [80–150 Hz]. However, the boundaries between bands are not well defined and can vary somewhat depending on whom you ask. Fig 1: Single EEG channels illustrating different types of oscillations. Since these oscillations are often larger when an individual is relatively inactive (e.g., eyes closed) some have interpreted them as the product of idling neurons with no functional importance. However, there is increasing evidence that these oscillations serve an important role in functions such as mediating communication between brain areas and coding neural representations. Moreover, these rhythms are useful for identifying macroscale brain networks and are clinically useful for detecting brain abnormalities (e.g., tumors), which can disrupt them. Fig. 2: [Left] Eyes-open resting state EEG spectral power density (SPD) averaged across data from 7 neurotypical individuals (unpublished data). Each line is the SPD at a different electrode. [Right] The topography of the SPD at 10.5 Hz. called “mu” rhythms, are present but are dwarfed by the much stronger posterior alpha oscillations. A second, much smaller peak in the theta range is also observed at frontal-midline electrodes (Fig 3; Fig 4-upper right). Peaks are generally not clearly observed in the other frequency ranges. Delta power is broadly distributed but greatest medially and centrally (Fig 4-upper left) and beta power is even more uniformly distributed (Fig 4-bottom right). Fig. 3: Same as Fig. 2 but the topography is the SPD at 5.4 Hz. Fig. 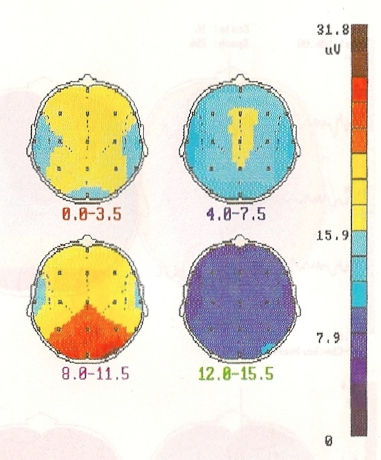 4: Topographies of resting EEG spectral amplitude density averaged across 43 individuals in delta [upper left], theta [upper right], alpha [lower left], and beta [lower right] frequency bands (Maurer & Dierks, 1991). It was actually surprisingly hard for me to find a published figure illustrating this. Fig. 5: Histogram of SPD peaks of resting state intracranial electrode data collapsed across all electrodes and participants. 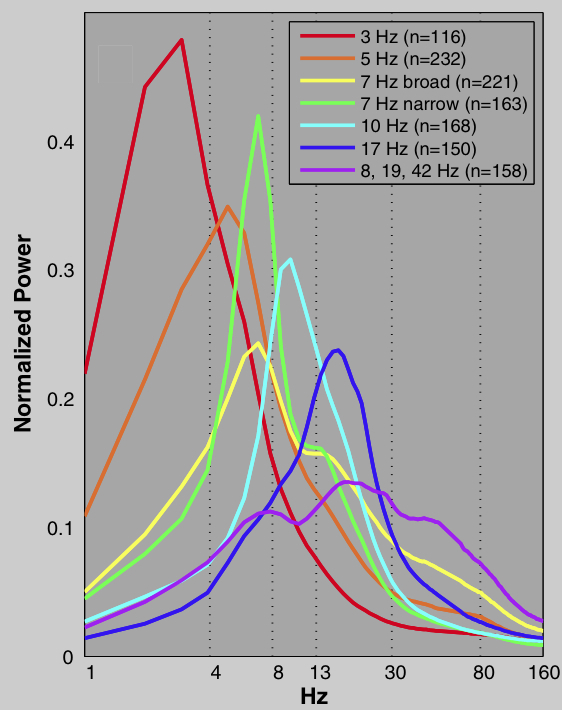 Note that Hertz is scaled logarithmically and the high proportion of peaks above 40 Hz is due to the flattening of the SPD distribution, which makes it difficult to distinguish true peaks from noise. channels in a few patients did exhibit high gamma peaks. There has been some debate as to whether or not high gamma activity reflects true oscillations or simply a general elevation in the 1/f distribution (Crone, Korzeniewska, & Franaszczuk, 2011). These few channels suggest that some brain areas can elicit oscillatory activity in this frequency band, though this activity is uncommon. In addition to the average distribution of these oscillations, it is important to consider how much variation there is within cortical areas and across subjects. Figure 9 shows the location of electrodes collapsed across all patients and color coded according to power spectrum type. Although some spectrum types clearly cluster together in areas, there is considerable variation even in the most homogenous regions (e.g., the pre- and post-central gyri). This is mostly due to individual variation in oscillatory activity. Fig. 6: Mean SPDs of seven clusters. Some individual variation is surely due to factors such as drowsiness, medications, and age that are difficult to control for when acquiring intracranial EEG data. However, I suspect that most of the variation reflects individual differences in functional architecture, which we know from non-invasive imaging of neuro-typical individuals is substantial (e.g., Mueller et al., 2013). If I’m correct, understanding this individual variability will be key to understanding both the underlying processes that generate these oscillations and their importance for brain function. Fig. 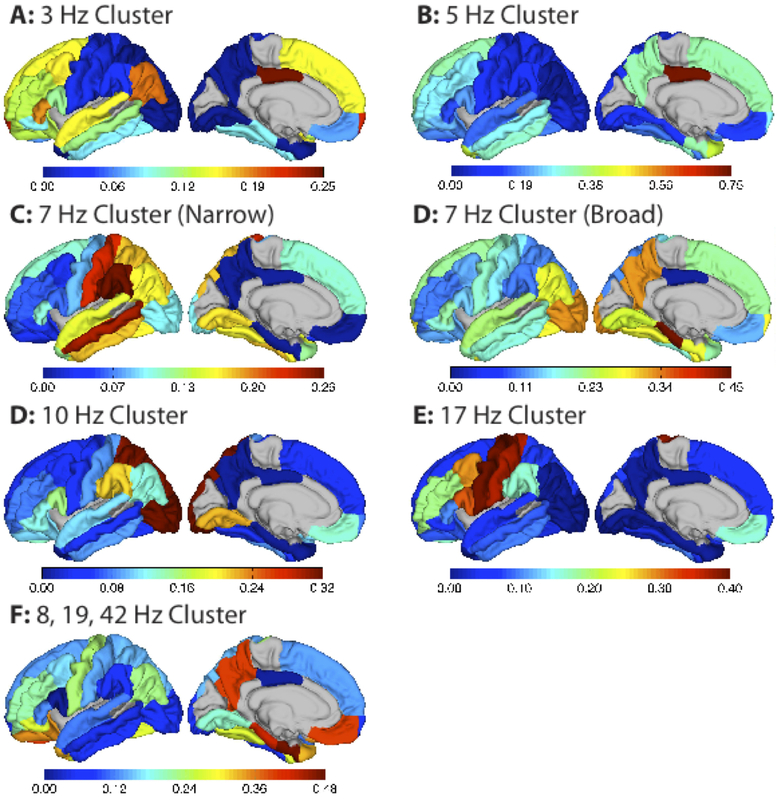 7: Proportion of electrodes in each cortical area (as defined by the Desikan-Killiany atlas) belonging to each cluster. Electrodes from both hemispheres have been combined to increase the number of electrodes per area. Only areas covered by more than one electrode (out of all 1208) are colored. All other areas are shown in gray. Fig. 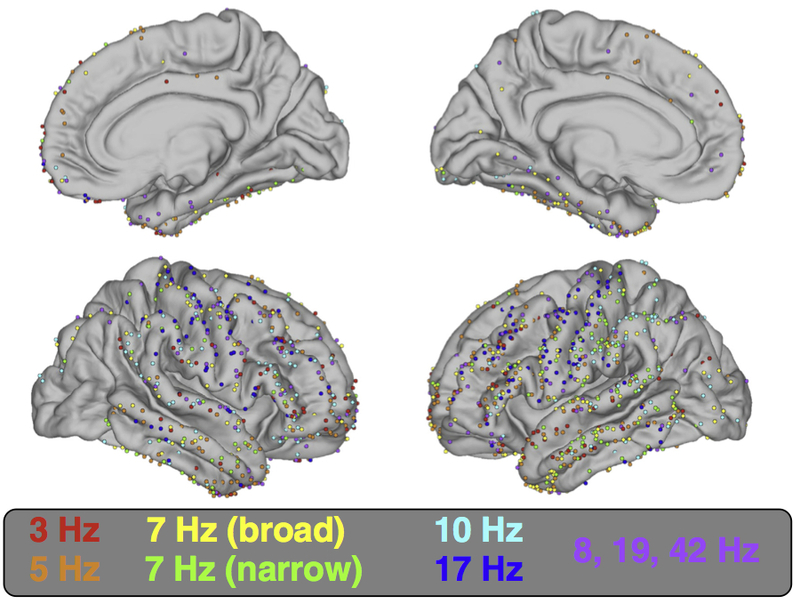 8: Locations of all 1208 electrodes on average cortical surface. Electrodes are color coded to indicate cluster membership (see Fig. 6).